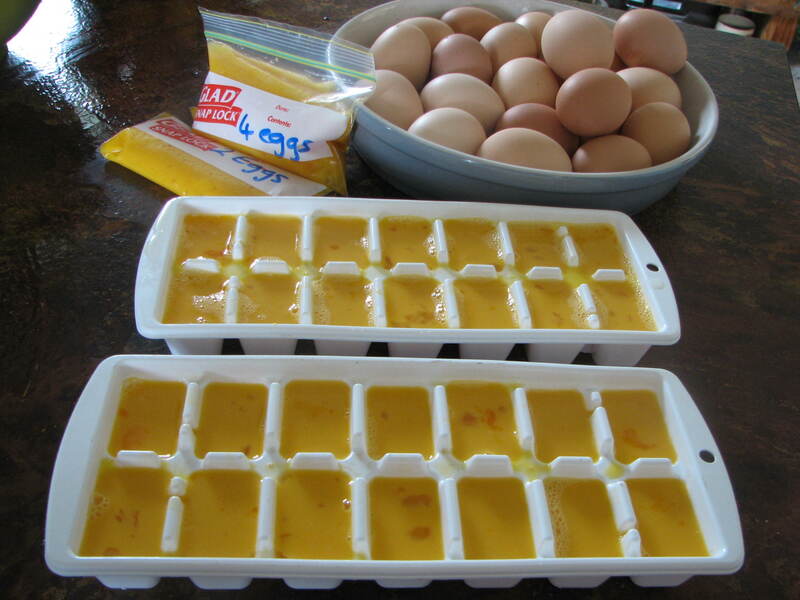 Freezing eggs and preserving….my busy time of the year. And so it starts – all those tiny seeds planted in spring by an very exuberant husband pays off in a barage of “stuff to do something with” now. There is 2- 3 months ahead of me in food processing and most days I love it, some days I wonder why on earth we do all this. Once it’s all finished though and we get to step back and see the years food all sitting there, it’s a satisfying thing.The garden is flourishing and gaps have been newly planted for autumn, the last chance to grow for winter food – bar the raised garden of greens out in the front yard and “yay” the glasshouse this year. 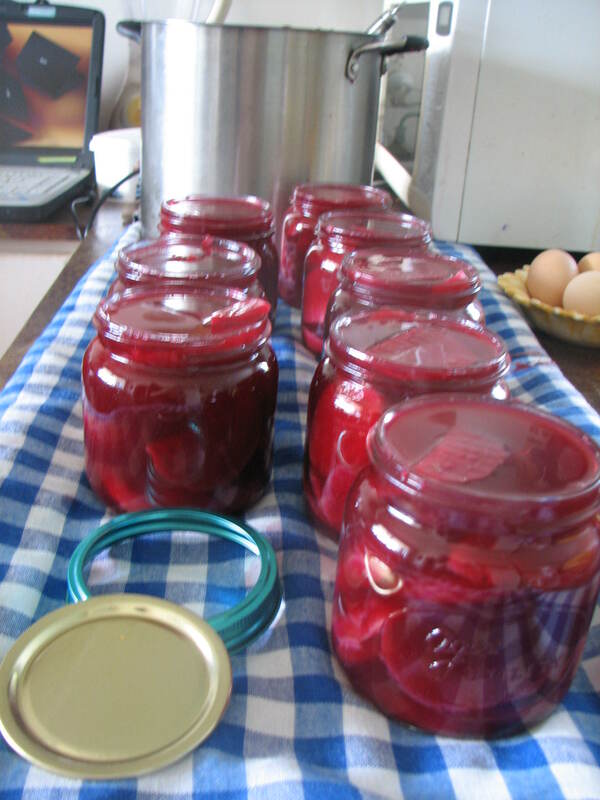 The recipe for this I found at http://hopeeternalcookbook.wordpress.com/2009/10/30/beetroot-chutney/ I had never tried it before so made just one quantity to try it. This has alot of ginger in and is spicy/gingery. I like it but I don’t think hubby will. Note my labels 🙂 🙂 This is so the lady of the house who wears reading glasses but doesn’t bother when getting food from the pantry, doesn’t serve up feijoa jam to go with cold meat when we have guests….again! I needed something BIG. I found these labels and was rapt, they peel off so next season I don’t need to soak anything off. A bonus, and worth every cent. 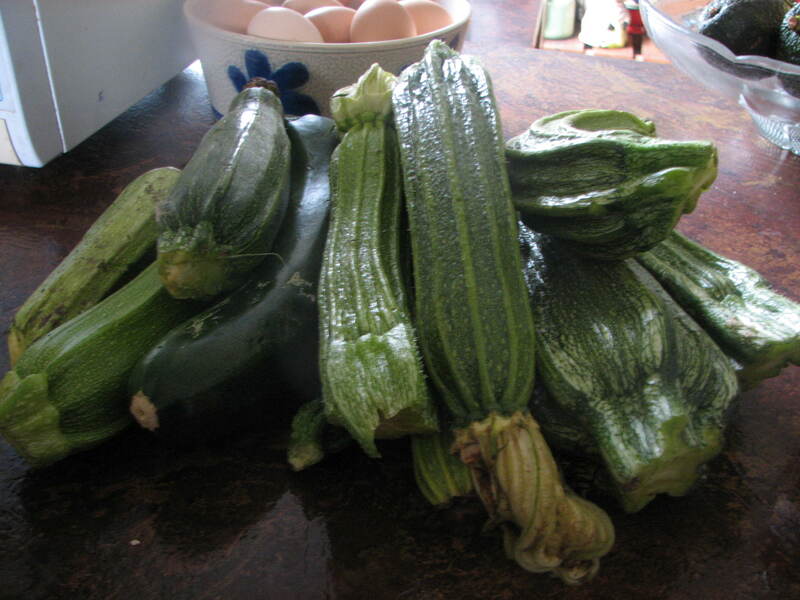 :):) Yep, we have a glut, especially as Roger planted 6 plants this year because he really likes the chutney I make and this vegetable is so versatile. We are giving it away left, right and centre lol. 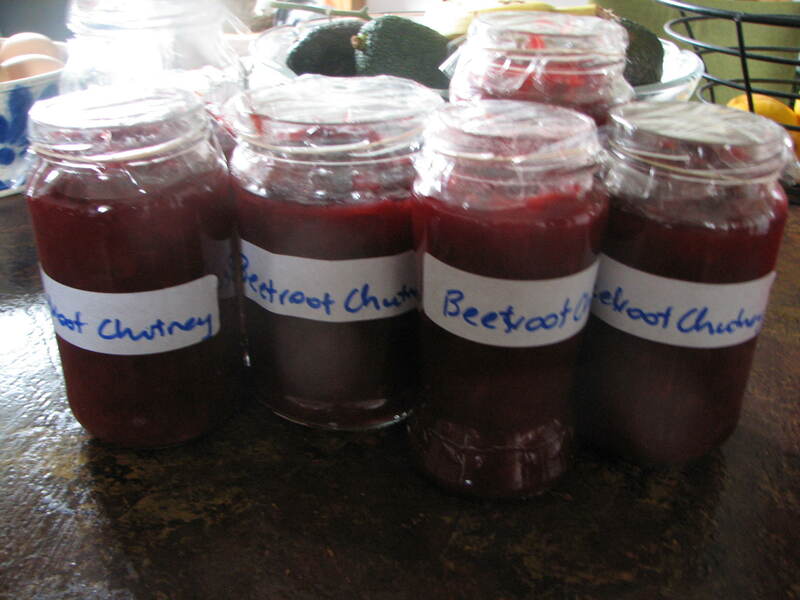 But I am freezing some, making heaps of the chutney because it gets ladled onto to everything all year long and we are eating it every night. 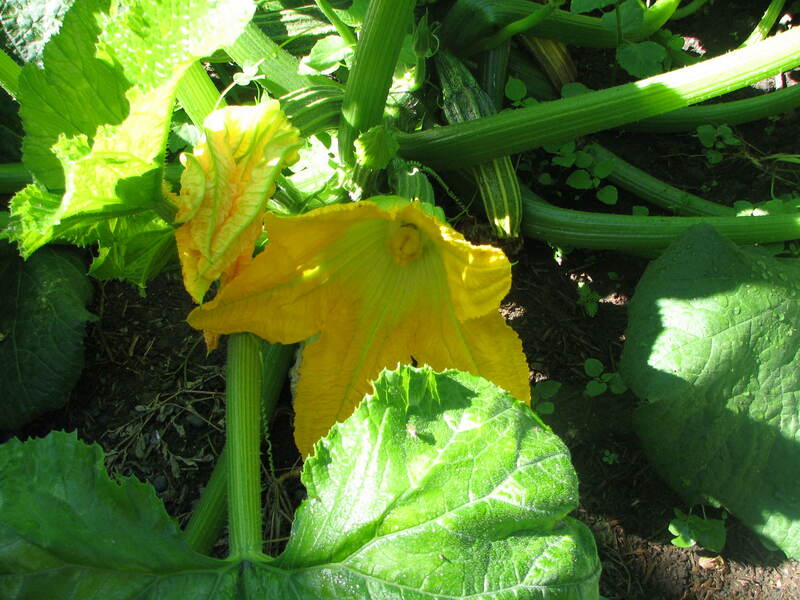 I tried zucchini chips but they didn’t work out – I will try it again at some stage. Yesterdays harvest minus the four marrow I gave away. 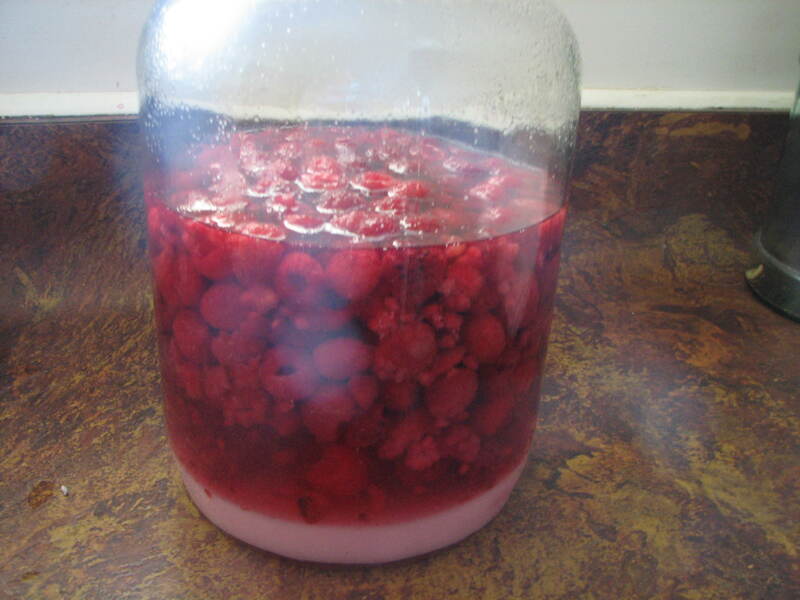 Raspberry Liqueur: A friend of ours who makes his own spirits kindly made us a batch of vodka. I would never buy vodka but wanted to try making my own fruit liqueurs and this is affordable and can be used with many different fruits. 1 lb of fruit, 3 cups of vodka and 1 1/2 cups of sugar. Leave to steep for a month, shake or stir regularly. Strain, sit a month then filter and rebottle, leave at least 3 months before drinking. Yep, I know….3 whole months!! I wonder if the same thing will happen that happened with our wine, drunk too soon but it was very good! I have slowly been adding dried vegetables to a large jar of dried soup mix. 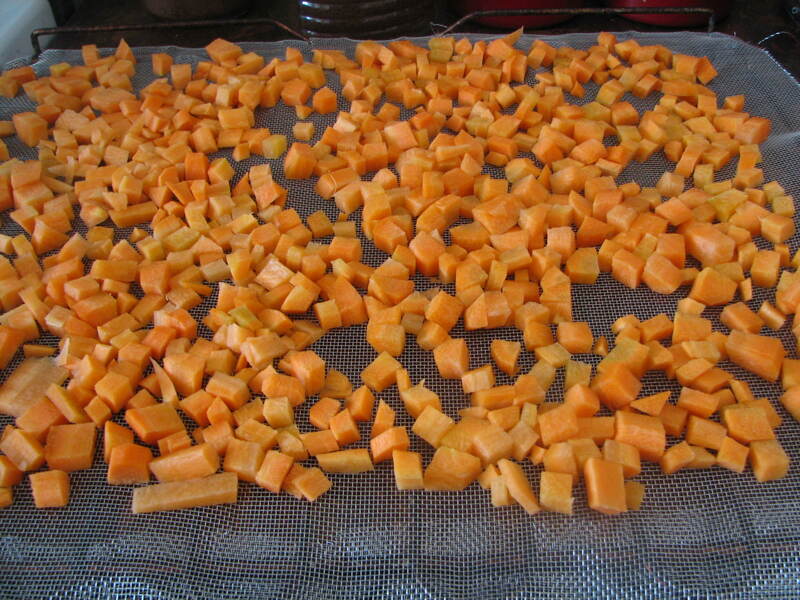 We bought a metre and a half of aluminium fly screen netting to place on top of our oven racks and vegetables can be tried overnight at 50 – 60 degrees. I have done carrots, beans, onions, pumpkin to add too lentils, barley, herbs etc. This is slow going but given I used to buy a packet of stockpot mix as a base to each pot I made I figure at least I know what is in my homemade. If I am just cooking for me omelettes are my meal of choice, using whatever is in the garden or fridge. This was particularly nice. Heat omelette pan with a tablespoon each of butter and olive oil. 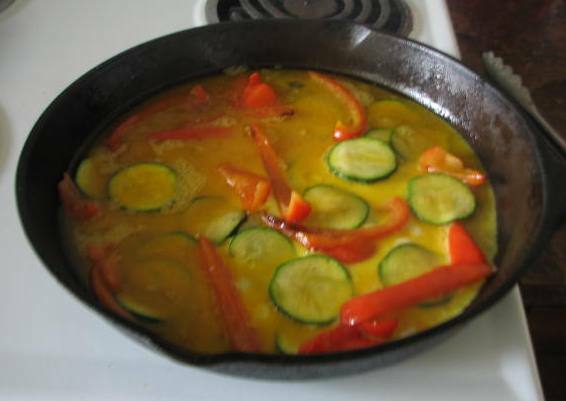 Slice red peppers and saute for a minute, add sliced zucchini and saute both until just tender. Beat together 3 eggs, a couple of tablespoons of water or milk, salt and pepper, and pour over vegetables. As the eggs are setting cover with baby spinach leaves, fold in pan and remove onto plate. Top with avocado. 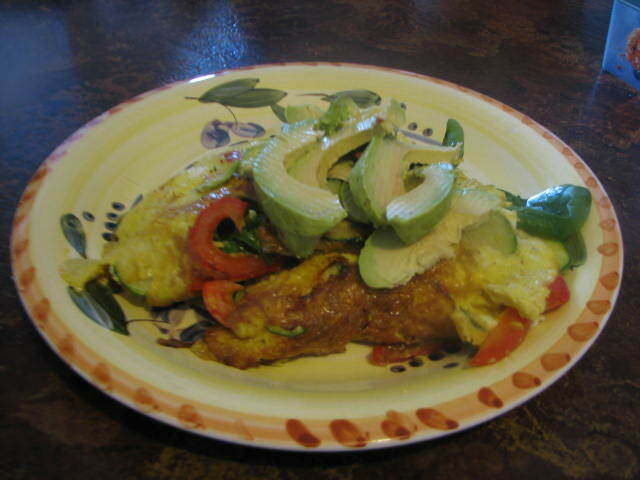 A good, tasty meal for one doesn’t get much easier or quicker than omelettes! 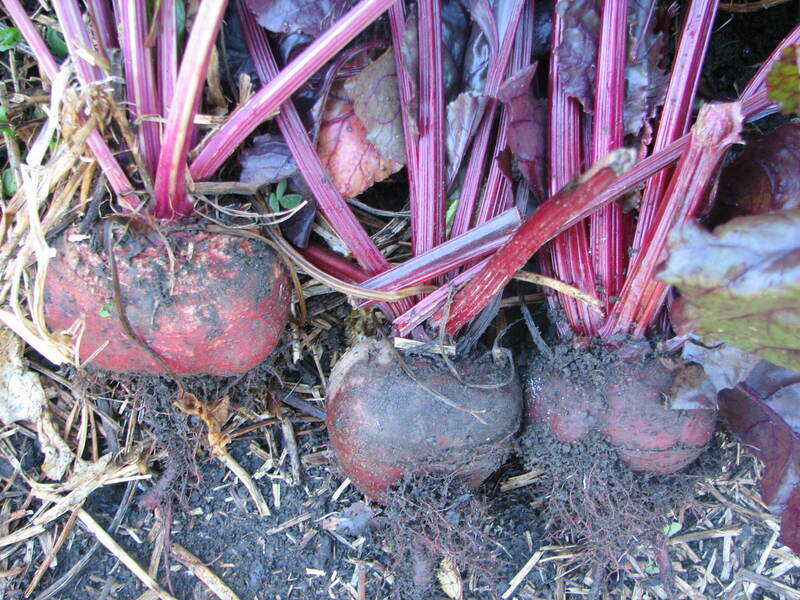 I found this recipe in Dr Libby Weavers book Real Food Chef, The Power of Plants. 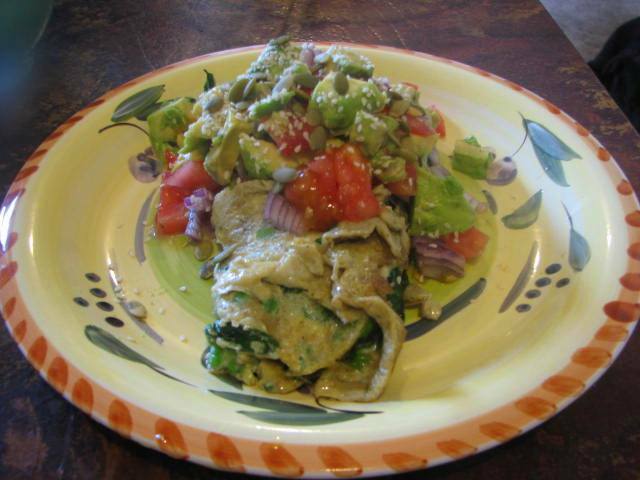 The omelette is full of baby spinach, parsley and peas and topped with avocado, tomato, red onion and seeds. I could eat this every night, it’s truly very good and takes only minutes to make really. I especially like that we grow all this ourselves with the exception of the avocado and seeds. Recipe is for one serving. Heat some oil, butter or coconut oil (your preference) in a non stick pan. Whisk the eggs, milk and seasonings, add the peas and parsley. The recipe suggests steaming the spinach tilled wilted but I just put it in the pan to wilt before pouring the eggs over it. While this is cooking make the salsa. Mix together the tomatoes, coriander, onion and seasonings. Gently combine with avocado. I have been making this for a couple of years, we really enjoy it. 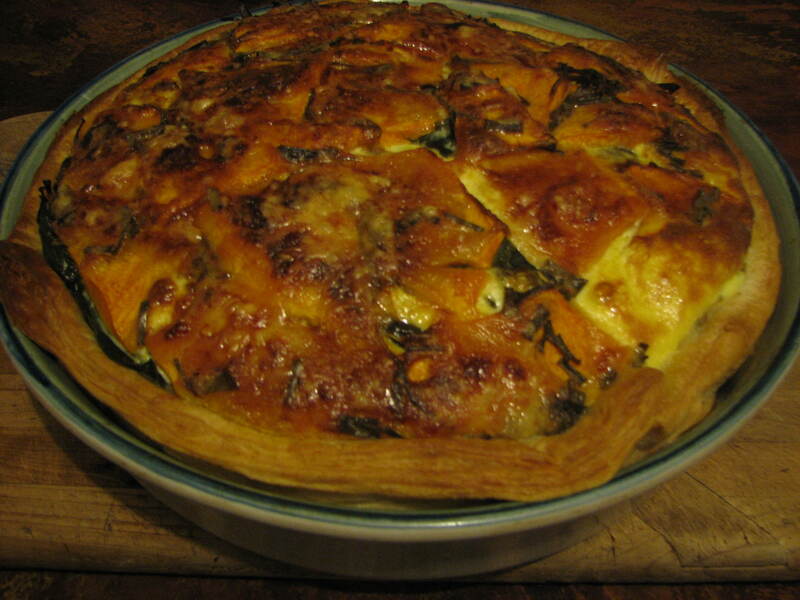 I am not quite sure of the quantities of some things, usually everything is just thrown in 🙂 We eat alot of quiches and frittatas to use the vegetables out of the garden but this is a favourite. Preheat oven to 380 deg. Spray dish with oil and line with pastry. Sprinkle 1/2 grated cheese over the pastry. 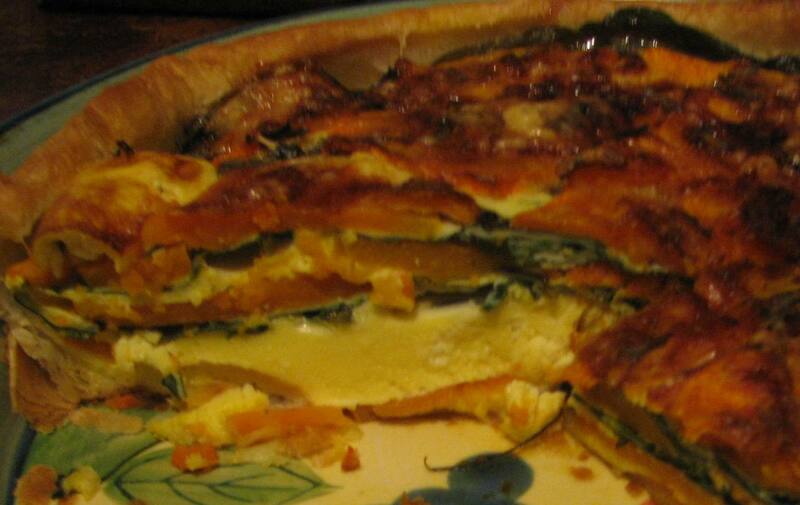 Spread a layer of pumpkin slices, sprinkle with chives and cover with silverbeet leaves. Repeat then make the last layer pumpkin (leaves burn if coming through the egg). Mix together eggs, cream, salt and pepper together and pour over vegetables, sprinkle remainder of cheese over and bake in oven till golden and a skewer poked through easily shows pumpkin is cooked. We usually have this with salad but tonight served with baked potatoes, beans and courgettes.